Currently Children’s Capoeira Classes are on Summer Break. Please join our Facebook Group to receive notification when they return or contact us. Capoeira is a Brazilian martial art disguised as a dance and performed to musical instruments and traditional Brazilian songs. It is comprised of specific offensive and defensive movements and, in contrast to other martial arts, the participant is constantly in motion. 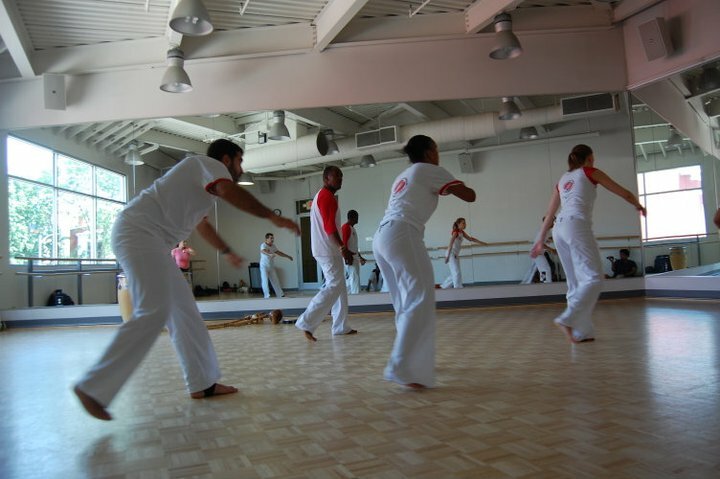 Students will learn the movements of capoeira along with the music and songs traditionally used in the sport. Contra Mestre Bomba has been teaching the art of Capoeira in Bahia, Brazil and more recently, in Washington, DC, for more than 20 years. Class is conducted largely in Portuguese, however students can easily learn by example. Children learning Spanish in their classes will have an opportunity to practice their vocabulary as well. Beginners should wear loose fitting clothing and light footwear. Big News: New Location + Weekday Classes Beginning Jan 10! First: Saturday classes have moved to All Souls Church at 1500 Harvard St NW! Same time (10:30 am – 12:00 pm) but just a few blocks away from the old space! This change is effective immediately and all Saturday classes starting January 7th will be at this location. Second: With the move to All Souls Church, we are now able to offer weekday classes! Join us Tuesdays and Thursdays from 7 PM to 8 PM starting next week – Tuesday, January 10! For the exciting new year and exciting new space, we are offering a special introductory price. All classes are $10 each from January 10 through January 31! Cash and credit cards are accepted on the day of the class. No advance registration is required, just bring a form of payment to the class and you’re ready to ginga! We also have a new, easier way to pay! For extra savings, buy a month pass for $80 for all classes during the month of January. Be sure to be there on Saturday morning to take full advantage of this great deal! Of course, you will still be able to buy the month pass after Saturday, but getting it this Saturday will give you the best savings for January. Note: Classes on Sundays remain unchanged! 11:00 am – 12:00 pm at BloomBars every Sunday.